I've written before about how I have wanted a "homestead" for such a very, very long time--almost all of my life! I didn't know that what I wanted was called "homesteading," though, until I started doing things I discovered were "homesteading things." If I remember ALL the way back to when I was a little girl, looking at the mountains in front of our house at sunset, I remember thinking that I wanted to be hermit one day and live in the mountains away from people, grow my own food, and have my own animals. I was a strange little child! :-) That is truly where my desire to have a homestead first began, unbeknownst to me. As I grew older, I thought you needed a place in the country with land to be able to have a homestead. My grandpa had a cattle ranch, and I think I identified that lifestyle with having a homestead. But when I think back on my own life, with the knowledge I've gained and the experiences I have had, I realize now that you can homestead without land. I think I have been homesteading for decades---only just not calling it that! You can begin your own homestead journey RIGHT NOW! No matter where you are. Even if you are living in an apartment in the middle of a bustling city, you can do it! Even if you have a suburban home with a little yard, an HOA, and neighbors all around you (like me)---you can start now! Homesteading is about working toward being self-sufficient, learning new and useful skills, and having as little an impact on our earth as you can. UPDATE: One of the coolest things I've discovered about my homesteading journey over the years is that it continues to keep evolving. As I write this update, Mr. V. and I are just three days away from signing the closing paperwork on our new homestead in the panhandle of Idaho. We've gone from urban to suburban, and now we are heading into a rural homestead adventure. So you see---start right now! Don't give up your dream. Anyway, here are 15 easy ways (action steps) you can start homesteading right this second, even if you are living in a city. You'll also need the right mental attitude---and I've also outlined the 5 mental attitudes you'll need to have for success. NOTE: Would you like a free eBook on Five Ways to Get Your Homestead Started No Matter Where You Live? Just complete the form at the end of this article! I decided to create two different lists for you. This first list is about the MENTAL aspects of homesteading, which I think are really the most important. The second list is a set of actionable steps you can DO right now. Therefore, you have the mental attitude aspect to the physical action aspect. 1) Develop an attitude of simple living. This has to do with learning how to make due with less. I know that's kind of counter-intuitive, because if you've read anything about homesteading, you'll know it is actually expensive, depending on how involved you want to get. But even if you are going all out, your mindset should be one of simplicity. Simple and traditional living doesn't really require a lot of money. Learning to reuse and repurpose things helps save money. And the more money you save, the more you can afford to put into the homestead lifestyle. Read books by people and about people who live traditionally. This will open your eyes to ways you can implement some of their strategies in your own life! Here's one to start out with: Money Secrets of the Amish. Or, one of my all time favorites: Essentialism. Study other homesteaders. Study people who live in tiny houses, or who make their own items. Study others who have gone before, and learn their ways. Experiment and practice on your own. As you walk into a store, ask yourself, "Do you really need that pair of jeans? Really?" Or can you get by another day without them. If you don't buy the jeans, maybe you can afford to buy the items needed to get started with some chicks, for example! 2) Stay out of the stores! Buy less, make more! If you adopt a more minimalist lifestyle, you'll find that having less creates more space in your life. And when you start becoming a producer instead of a consumer, you'll experience a whole new level of empowerment. For example, making soap. I make natural handmade soap for a lot of reasons. The main reason is due to health concerns. Besides that, it's just plain fun. But most of all---I do not need to buy soap at the store any more. I can't remember the last bar soap I bought. There are other items I don't buy any more either. Just you watch! Start having fun making your own things, and see how little you'll need to buy! Here's an article I wrote awhile ago about 18 Necessities I Never Buy at the Store Anymore and What I Do Instead. There are a lot more than 18 things, these days, and I guess I'll be needing to update that article soon too. In fact, here is a new article on over 50 Things We No Longer Buy you might also be interested in! 3) Embrace learning. It's great for your brain! If you subscribe to my newsletters, you probably know how strongly I feel about learning new things ALL the time. Start right now! Enroll in a course on a topic you are interested in. Herbalism: The Herbal Academy of New England has lots of courses, and there is sure to be one perfect for you and your experience level. They also have a great course on Herbal Fermentation and Wildcrafting/Botany. I love this school! Cheese Making: The best course I've taken (so far) on how to make cheese and other cultured dairy products is Corina Sahlin's course. Here is a link that will take you to her cheese making course as well as her fermentation course. She is very engaging and she makes learning these skills easy! Cook from Scratch and Cook Traditionally: My friend, Wardeh Harmon, runs the Traditional Cooking School, and she offers many free options to get you started before you actually decide to pay for a full course. Here is a link to free Healthy Mama Menu Plans. Soap Making: There are several ways to make soap, and it's really a great idea to experience several of them. There is my own eBook that will teach you How to Make Hot Process Soap with Confidence. My other favorite person to take soap making courses is The Nerdy Farm Wife, (Jan Berry) who also has many options. Her book, Natural Soap Making, is found on Amazon. She also offers lots of different eCourses too. Another great book, by my friend, Kelly Cable, over at Simple Life Mom, Natural Soap Making for Beginners, is also found on Amazon. Preserving Foods: My friend, Kathie, over at Homespun Seasonal Living, also has some excellent courses on making homemade jams and living seasonally. 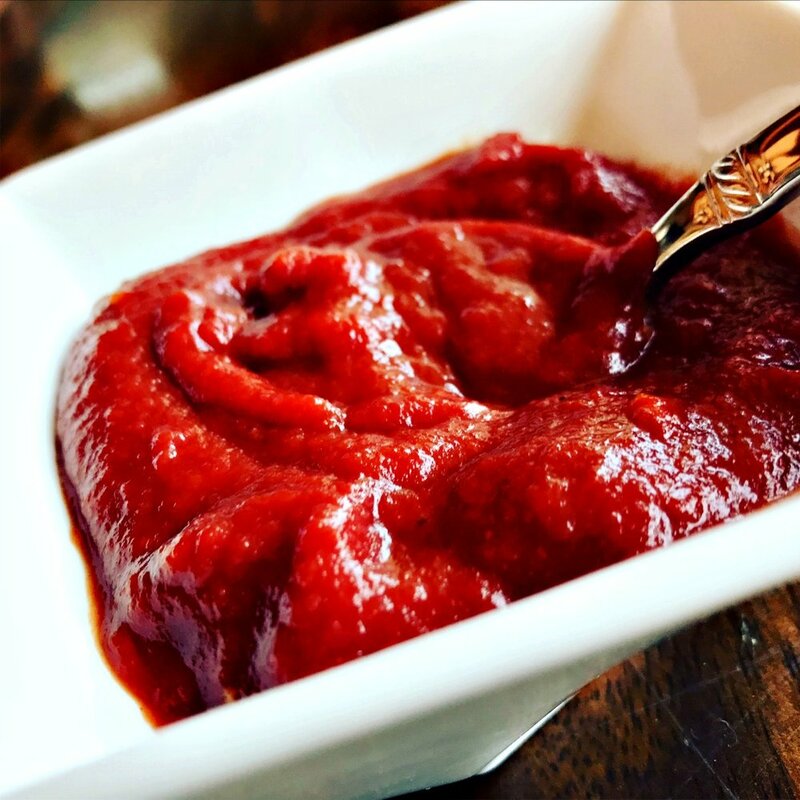 This is homemade fermented ketchup. It's not only healthy and filled with probiotic, but it's the most delicious ketchup you'll ever eat! Learning how to ferment your foods is a traditional cooking skill that will help keep you healthy. Here's the recipe and directions for this fermented ketchup, if you're interested. 4) Develop a community with others and share skills. Be open to new friends. Closely related to #2, when you learn how to do things yourself, you are well on your way to some real self-reliance, at least in the areas you have experienced. This is where community is important. Nobody can know everything. Find others who have skills you don't have and share! Barter. Trade. Give. You'll be surprised at how knowing others who have a great variety of skills contributes to a true sense of self-sufficiency, even if you need to call someone for help. 5) Don't be afraid to try. Believe it or not, it takes courage to learn new skills, to try things and possibly fail. But failings are lessons in and of themselves! I've been trying to learn how to make decent sour-dough bread for...get this: 9 months! And I'm still trying. To start your herbal journey, here are some resources to get your started! ** The first book I ever read about using and growing plants for medicine is Medicinal Herbs by Rosemary Gladstar. She has lived an esteemed life as an herbalist, and I have to say that everything I have tried that originates from her has worked! ** The Herbal Academy of New England is absolutely hands down an excellent way to learn about herbs! Their courses are comprehensive, interesting, easy to access, and fun! Click the link below or see my sidebar to see their many learning options. Making your own plant medicine is very empowering. Knowing you don't always have to rush to the doctor's office to take care of illnesses and health issues is so valuable! When I was living in an apartment years ago, I used to grow herbs on my windowsill. I learned that some plants can grow with very little space and little light. And some plants, like basil, sweet potatoes, and lettuce can be grown in water! Amazing! Then I moved into a home with an actual yard! It was certainly your typical suburban yard...grass, a couple of trees, and the requisite edging with beds of shrubs along the outside. So, I decided I'd plant my edible plants among the landscape shrubs. I'm so glad I experimented with this! I ended up with all kinds of wonderful food, and the yard looked amazing! Some of my favorite gardening resources include Amy Stross's Suburban Microfarming, Square Foot Gardening, and many more. There are so very many more resources about gardening out there! I began this article thinking it would be a quick little introduction to how you can begin homesteading right now. 10 Things Every Beginning Gardener Should Know. Hands down, this is the one thing that you can start doing no matter where you live! Live in the city? Track down the farmers markets or join a CSA to always have seasonal veggies on hand. You will find that you have too many to use at one time because veggies often become ripe all at once. You can learn how to can, ferment, and dehydrate your own vegetables and fruits! It's seriously a rewarding experience! Not only is it rewarding, but there is just something so fulfilling about seeing your pantry or store room lined with all those beautiful Mason jars full of food YOU preserved! For canning: Ball Complete Book of Home Preserving. The Idiots Guide to Fermenting Foods. For dehydration: The Ultimate Dehydration Cookbook (and I love my Excalibur Dehydrator)! And guess what?! All you really need to make your own DIY products is a kitchen! Learn how to make beautiful natural handmade soap! Make your own soap! It's incredibly fun, besides being useful and way more healthy than using store-bought soaps. Eating good food right now and paying attention to your health is something we should all be doing all the time anyway. However, if you are dreaming about having a homestead one day, taking great care of your fitness and learning to eat whole foods will make the transition even easier! Also--in the event of a disaster or emergency, being a healthy weight and in shape is a real plus. Start now to get your physical body in gear. I need to heed my own advice on this! Here is an article about foods you think are healthy, but are really BAD for you! You might be living in an area where you can't really have animals---like an apartment. But you can start thinking about those animals you'd like to have and begin learning about them! When we bought this 3/4 acre property, I hadn't done this---taken care of the learning ahead part, that is. We began with chickens, then on the spur of the moment a few months later, we decided to start with goats...and then those goats had more goats...and all of a sudden we realized we were in over our heads with all those goats! We had to let the goats go for the time being, until we did more research about different breeds that would be right for us. If we had done our learning first, instead of trying to learn too late, we would have been a lot better off! Besides chickens, maybe you might want to explore keeping rabbits? They do not require a lot of space, and they are easy to keep. Many people love them for meat or for their fiber (Angora breeds). This little guy is about three weeks old. This section is closely related to the above section. If you are going to keep goats, rabbits, etc., you might just want to consider learning to harvest your own meat. There are a lot of tutorials on this, and I highly recommend starting right now.... Learning, that is. Most state regulations are fine with a family harvesting meat for themselves, but you probably should check just in case if you are interested in this. Welcome to the Farm by Shaye Elliott has some good basic information to get you started. How to Keep Homestead Animals Healthy. This is still on my goal list! I've purchased several books, and every time I'm at the local feed store, I'm checking out the beekeeping supplies. Now, it's just a matter of talking the hubs into building me a hive! :-) And ordering the bees of course! This will be one of those things I'll be learning as we do! You can find out lots more about raising bees over at A Life of Heritage. Gosh, there are so many things you can learn to make...right now! Last year, I tried my hand at making beer and candles. I'm still figuring these out! And that's ok! The learning process is exciting, and every failure brings me closer to a great outcome! I've been making soap for years, but at first, it was....well, interesting, I guess you could say. :-) I had a couple of near tragedies, but now my bars are exceptional and in great demand, too! Here are links to a couple of tutorials I've created: Learn to make my favorite hot process soap! My eBook is specific for making one great never-fail hot process soap recipe and then recipe variations for your own unique customizing so it's your own soap your way! ***One area I am very weak in is sewing. I keep meaning to learn to sew. If you can sew, you own a great homestead skill, in my opinion! Learning to sew is one of my goals in the next three months! Anyhow----just start doing. And learning. And trying. Yes, this one is kind of hard. Especially if you live in a city where you can just run to the store any old time for just about anything....you really need to consider what life might be like if you no longer have that ability for some reason. When we moved out of Las Vegas an hour away, to an area with NO stores or gas stations or anything at all, well, I learned really fast that making do is a great homestead skill to develop. The other homestead skill that goes along with this is being prepared. We all should be prepared for potential emergencies in the areas of medical, food, light, water, etc. Here's a great article on How to Shop Like a Minimalist, with lots of ideas to keep in mind before you buy that THING! Here's another great article about Seven Ways it Pays to be Frugal (And They're Not All Financial Either). Also---want to save money? Try Save Money Now: 50 Things to Do if Your Money is Tight. OK---The last just flows right into this one! :-) If you are becoming a homesteader, you will want to give some consideration to keeping stores of food. Not only does this allow you to eat whole foods even when out of season, but it is also a great way to prepare. When I started reading homestead blogs a couple of years ago, I quickly realized that homesteading and preparedness go hand in hand. Here is an article you'll enjoy about getting started on your food storage journey. This is related to being prepared, which is a skill many homesteaders try to develop. I went years before I finally got my "get home" bag together. This is similar to a bug out bag, except that it is meant to help you deal with emergencies if you are away from home and potentially need to hoof it. It's not as extensive as a bug out bag, but it could save you and your kids' lives if something happens. You can read my article about getting my own get home bag together for more information. Here is another one I am still working on! I look at all these delicious bread recipes, and I just know I need to do more in this regard. I used to make bread with a bread machine, and those are just wonderful, I have to say. Here is a SUPER easy Seeded Bread recipe--It's a dump, rise, and bake recipe, and I LOVE it! There's nothing better than homemade bread! Essential Oils were mentioned briefly above in the Plant Medicine section. But I think another mention should be made here. Besides using essential oils for medicinal reasons, they can be used in your body care products, to affect and improve your mood, and to cleanse the environment in your home or office, among other things. If you are interested in learning more about essential oils, my favorite book is The Complete Book of Essential Oils and Aromatherapy by Valerie Ann Worwood. How to Choose a Good Essential Oil Company & Some Options, and many more! Arguably, this skill is one some people might think doesn't have to be in a homesteading article or be a necessary skill to develop. But my opinion is that owning a gun and knowing how to use it are requirements if you live in an area where you may encounter predators. Gee! That could be just about any where! I come from a long line of hunters and self-sufficient types, anyway, so having guns around has never bothered me. My husband now hunts as well. I choose not to hunt, although I have no problem cooking it up! However, you just never know when you might need to protect yourself or your family, and I'd rather be prepared now than be a victim later. When it's time to clean up the garden in the Fall, chickens are the perfect way to go about this. Not only do they provide eggs and meat, but they can help in the garden too! You know what? I didn't start out knowing any of this. These skills and knowledge I've learned has happened over many years of continually taking courses, reading books, talking with others who are more experienced, and intentionally expanding. You can do this too! The key is START. Start anywhere you feel a tug of interest. But just get started. You'll find, once you get started, that your interests and skills will grow....and grow, and keep on growing! You'll also run into like-minded people, and all of a sudden, you will have developed a community. What an adventure! The best advice I can give you as you begin your journey to self-reliance (or like me, are continuing it----cause it never ends! ), is to have fun! Enjoy the successes, the failures, and the pride you earn when you accomplish new things! :-) Enjoy watching yourself change and grow, mentally, physically, and in community! P.S. In case you forgot, go ahead and sign up for the Newsletter, and never miss a thing! And guess what? You’ll also get access to the free Resource Library, where you can download and use all kinds of free eBooks, guides, checklists, and more on all the topics I write about on the blog. I update it weekly! Enjoy! Just complete the form below. Disclaimer: I am not a medical professional and in no manner anywhere on this website is there any promise, implied or implicitly stated, of cure, treatment, diagnosis, or prevention of any health issue. Please seek medical attention from your medical practitioner.